Whether they're keeping paws off the carpet or noses out of the trash, pet parents fight an uphill battle with curious cats and dogs. 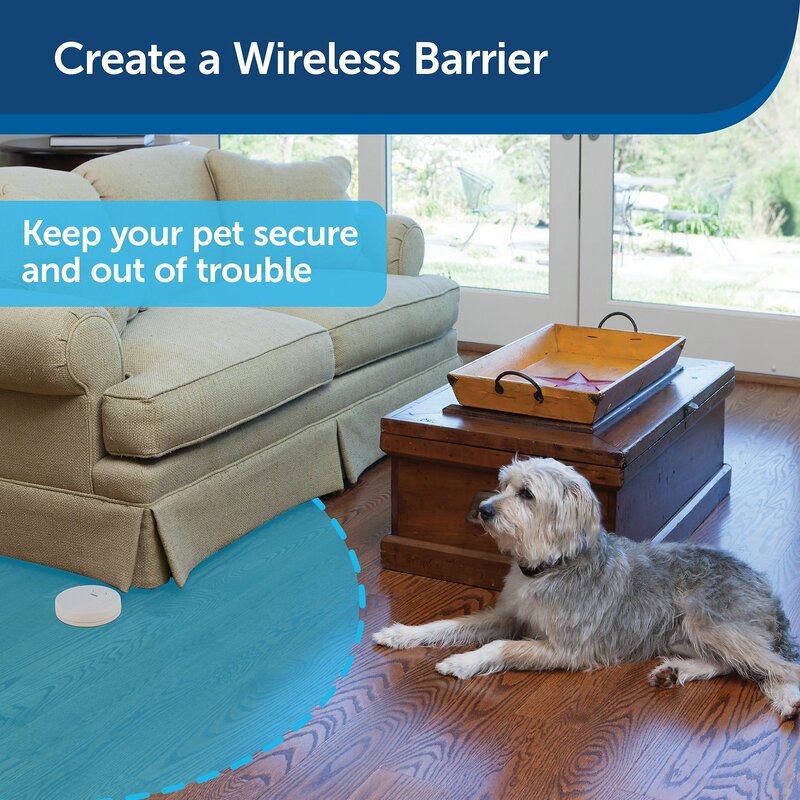 The Pawz Away Indoor Pet Barrier from PetSafe helps by emitting a high-pitched tone and safe, static correction whenever a pet crosses the invisible barrier defined by the sleek, nonobtrusive transmitter. 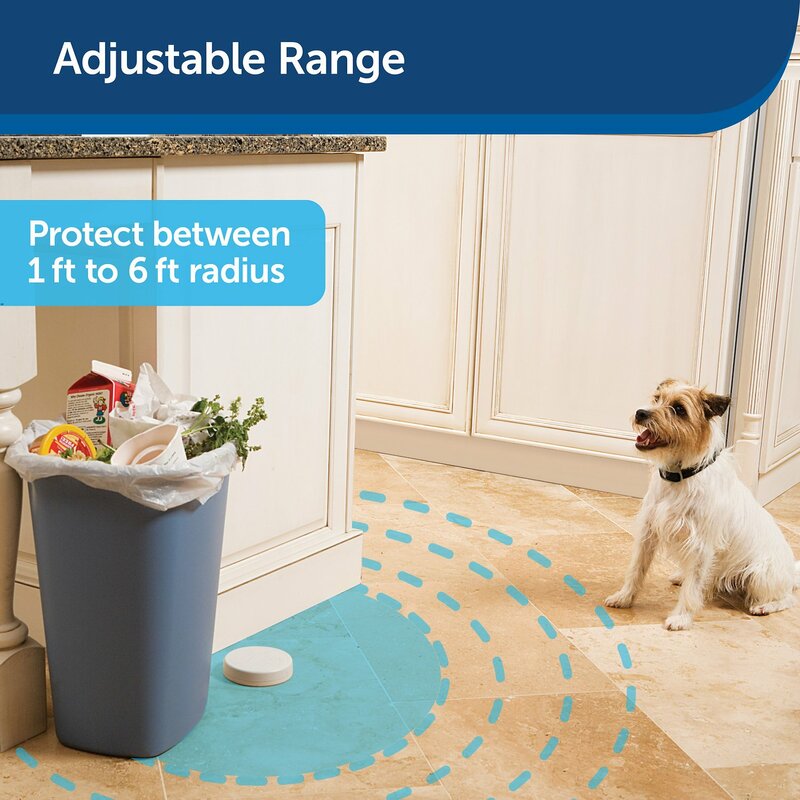 The included collar uses a progressive static to safely associate certain areas with an unexpected correction that reminds pets there are better places to play. System includes: lightweight, waterproof receiver collar and compact transmitter. For indoor use only with dogs and cats 5 pounds and up, fits neck sizes 6 - 28 inches. Range adjustable from 2 - 12 feet in diameter. Progressive Static Correction- begins at the lowest level and increases to maximum in 3 seconds. Collar stops delivering correction after 15 seconds. Transmitter uses 3 AA batteries (not included); receiver collar uses two 3-Volt lithium batteries (included). Barrier transmitter (3 alkaline AAA batteries required, not included), Receiver collar with two 3-volt lithium batteries, Operating and training guide, collar strap, Test light tool. Click here for 3-Volt RFA-35-11 Lithium Batteries. Click here for an extra receiver collar. I wanted a safe way to stop my cats from going out the doggie door & this was recommended on google. 25 foot radius- it doesn’t even work when the cat stands on top of it. Now I cannot return it since I cut the collar to fit & threw away the boxes. This operated as expected, however it did not deter our dog. If I could have turned up the intensity of the “pulse,” it would have worked. I’m going to try the Scatmst, as that one has three intensity levels. My dog is super smart and creative in ways to get in trouble. No matter what I did I couldn't keep her from raiding the counter or stealing cat food. She even turned the stove on (twice) and caught a spatula on fire while trying to steal food. With this she hasn't even gone near the counter for 2 weeks. Even without the collar on she hesitates to go near the counter. I had trouble with my new kitten going out the doggy door. For some reason my other cats never did use it, this one did. I used the collar on him for about a month, now he won’t go near the door at all even without it on. The barrier can’t be attached to metal, so I just set it on the ground right in front on the door then set the distance for activation to four feet. It worked like a charm. If the cat ever changes his mind and decides to try outdoor exploring again I can just put the collar back on him and the barrier back on the floor. Did not work as well as I hoped. Tried it on a long haired ragdoll who weighs 16lbs and a ds who weighs about 5! Ragdoll would just sit in front of it and the skinny one would walk right past it. Maybe I didn't have collar tight enough? Purchased this item to keep my cat from going out our newly purchased (from Chewy) dog door. The collar works like a charm. My cat won't go near the door with her collar on! Love it!!! 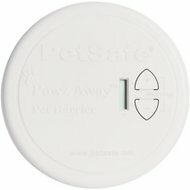 This product has really helped my bloodhound. She was all over the place getting into everything. Now she knows her barriers. She is 4 months old and a handful.